The Piri Reis Map - What's the Real Story? A great deal of scholarly debate exists--of all things, over a map. The Piri Reis map however, is not just any old map. It is a map that was created in pre-modern days, compiled, so the story goes, in 1513, by the admiral to the Ottoman Turkish empire; Piri Reis. Only half of the map survives. That portion of the Piri Reis map which does survive is a remarkably accurate representation of all of the coasts of Europe, Northern aspects of Africa, Brazil, and areas that include the Azores, the Canary Islands, Japan, as well as an island that was considered mythical, Antillia. The significance of the ancient world map lies in three areas. What Makes the Piri Reis Map Special? It shows us that a great deal more exploration had taken place than we previously believed. It also offers a glimpse of some areas that we've considered myth. It demonstrates to us that a great deal more exploration had taken place earlier than we had supposed. The Map shows of some exploration of what is called the New world far earlier than we'd imagined it had taken place. . . and lastly, it shows some areas beneath the ice when that area had not been beneath ice for more than 5000 years. How Was the Piri Reis Map Discovered? 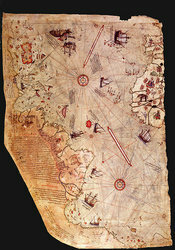 The discovery of the Piri Reis map took place in the latter part of the 1920s. It was fortuitously found by Gustave Deissmann. The Turkish Ministry had hired him to catalog a library which housed both Islamic and non-Islamic items. His position entailed cataloging the non-Islamic items that were part of the Topkapi Sarayi library. He requested that he be permitted to search the palace and the surrounding buildings for older maps and charts. Halil Edhem found some bundles of maps and charts, as well as other paperwork that had been long overlooked. He passed those over to Deissmann who found the ancient world map inside it and believed that it could have vast historical significance. Deissman took the map to an orientalist who identified it readily as a map which had been drawn by the chart-maker, Piri Reis. The discovery of the partial ancient world map was an overnight sensation. It caused nothing less than a total buzz internationally. It was the only known surviving copy of a map of the world during the time that Christopher Columbus had sales. Geographers, historians and many others had been searching for centuries for what they called the "lost maps of Columbus." What Else Makes the Piri Reis Map Controversial or Unique? The last and perhaps most controversial and unusual thing about the map is that it is not only an ancient world map, but comes from a chart-maker who was notable in his field and well versed in the way that a map should be drawn to show various kinds of climate. The coast that is shown, the eastern portions of South America and the northerly coastline of Antarctica were detailed nearly perfectly. The problem was that they were detailed more than 300 years before that region was discovered. In addition, they show the coastline without any ice. The evidence that we have says that it would have been about 4000 BC the last time that the region that he charted without ice, would have been free of the ice which had covered it. How did he get an accurate coastline without the ice in a time when the ice had to be covering it and in a time that was well before that region had been explored at all? How did Piri Reis get the information that he obviously had to make the charts and maps that he created? Did he use some long ago drawn ancient world maps or charts, or is there something else that we don't know about the area that he charted? How was the Piri Reis map really made... and when?